Washington, D.C. – President Richard Nixon and his national security adviser Henry Kissinger believed they could compel “the other side” to back down during crises in the Middle East and Vietnam by “push[ing] so many chips into the pot” that Nixon would seem ‘crazy’ enough to “go much further,” according to newly declassified documents published today by the National Security Archive (www.nsarchive.gwu.edu). Nixon’s and Kissinger’s Madman strategy during the Vietnam War included veiled nuclear threats intended to intimidate Hanoi and its patrons in Moscow. 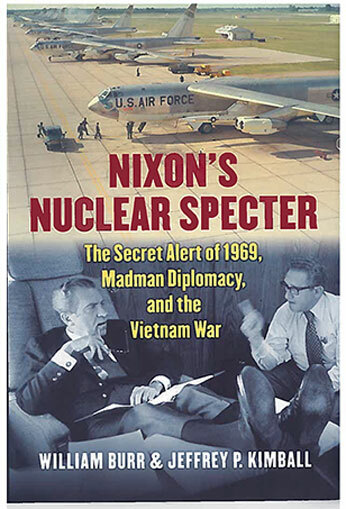 The story is recounted in a new book, Nixon’s Nuclear Specter: The Secret Alert of 1969, Madman Diplomacy, and the Vietnam War, co-authored by Jeffrey Kimball, Miami University professor emeritus, and William Burr, who directs the Archive’s Nuclear History Documentation Project. Research for the book, which uncovers the inside story of White House Vietnam policymaking during Nixon’s first year in office, drew on hundreds of formerly top secret and secret records obtained by the authors as well as interviews with former government officials. With Madman diplomacy, Nixon and Kissinger strove to end the Vietnam War on the most favorable terms possible in the shortest period of time practicable, an effort that culminated in a secret global nuclear alert in October of that year. 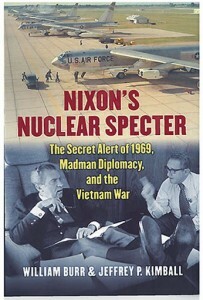 Nixon’s Nuclear Specter provides the most comprehensive account to date of the origins, inception, policy context, and execution of “JCS Readiness Test” – the equivalent of a worldwide nuclear alert that was intended to signal Washington’s anger at Moscow’s support of North Vietnam and to jar the Soviet leadership into using their leverage to induce Hanoi to make diplomatic concessions. Carried out between 13 and 30 October 1969, it involved military operations around the world, the continental United States, Western Europe, the Middle East, the Atlantic, Pacific, and the Sea of Japan. The operations included strategic bombers, tactical air, and a variety of naval operations, from movements of aircraft carriers and ballistic missile submarines to the shadowing of Soviet merchant ships heading toward Haiphong. To unravel the intricate story of the October alert, the authors place it in the context of nuclear threat making and coercive diplomacy during the Cold War from 1945 to 1973, the culture of the Bomb, bureaucratic infighting, intra-governmental dissent, international diplomacy, domestic politics, the antiwar movement, the “nuclear taboo,” Vietnamese and Soviet actions and policies, and assessments of the war’s ending. The authors also recount secret military operations that were part of the lead-up to the global alert, including a top secret mining readiness test that took place during the spring and summer of 1969. This mining readiness test was a ruse intended to signal Hanoi that the US was preparing to mine Haiphong harbor and the coast of North Vietnam. It is revealed for the first time in this book. Another revelation has to do with the fabled DUCK HOOK operation, a plan for which was initially drafted in July 1969 as a mining-only operation. It soon evolved into a mining-and-bombing, shock-and-awe plan scheduled to be launched in early November, but which Nixon aborted in October, substituting the global nuclear alert in its place. 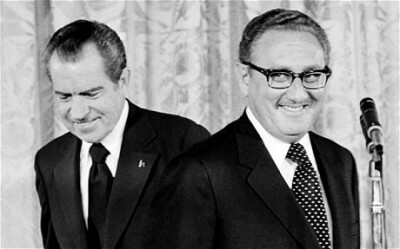 The failure of Nixon’s and Kissinger’s 1969 Madman diplomacy marked a turning point in their initial exit strategy of winning a favorable armistice agreement by the end of the year 1969. Subsequently, they would follow a so-called long-route strategy of withdrawing U.S. troops while attempting to strengthen South Vietnam’s armed forces, although not necessarily counting on Saigon’s long-term survival. The Navy’s plan in April 1969 for a mine readiness test designed to create a “state of indecision” among the North Vietnam leadership whether Washington intended to launch mining operations. 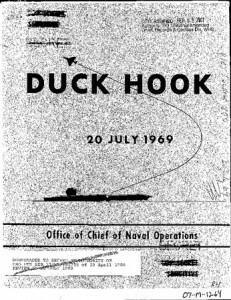 The Navy’s plan for mining Haiphong Harbor, code-named DUCK HOOK, prepared secretly for Nixon and Kissinger in July 1969. 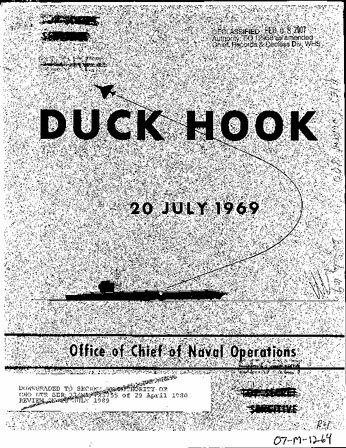 The cover page to the Navy’s Duck Hook plan for mining Haiphong Harbor, developed in July 1969 at the request of President Nixon and national security adviser Kissinger. A telegram from the U.S. Embassy in Manila reporting on the discovery of the mining readiness test by two Senate investigators, including former (and future) Washington Post reporter Walter Pincus. After learning about aircraft carrier mining drills in Subic Bay (the Philippines), the investigators worried about a possible escalation recalling that Nixon had made such threats during the 1968 campaign. A report from September 1969 on prospective military operations against North Vietnam (referred to unofficially within the White House as DUCK HOOK) included two options to use tactical nuclear weapons: one for “the clean nuclear interdiction of three NVN-Laos passes”-the use of small yield, low fall-out weapons to disrupt traffic on the Ho Chi Minh trail. The other was for the “nuclear interdiction of two NVN-CPR [Chinese People’s Republic] railroads”-presumably using nuclear weapons to destroy railroad tracks linking North Vietnam and China. A Kissinger telephone conversation transcript, in which Nixon worried that with the 1 November deadline approaching and major anti-Vietnam war demonstrations scheduled for 15 October and 15 November, escalating the war might produce “horrible results” by the buildup of “a massive adverse reaction” among demonstrators. As part of the White House plan for special military measures to get Moscow’s attention, an October 1969 memorandum from the Joint Staff based on a request from Kissinger for an “integrated plan of military actions to demonstrate convincingly to the Soviet Union that the United States is getting ready for any eventuality on or about 1 November 1969.” . A Department of Defense plan for readiness actions that included measures to “enhance SIOP [Single Integrated Operational Plan] Naval Forces” in the Pacific and for the Strategic Air Command to fly nuclear-armed airborne alert flights over the Arctic Circle. The thematic focus of Nixon’s Nuclear Specter is Madman Theory threat making, which culminated in the secret, global nuclear alert. But as the Kissinger statement to Dobrynin cited above suggested, a core element in Nixon’s and Kissinger’s overall Vietnam War strategy and diplomacy was the concept of a “decent interval” between the withdrawal of U.S. forces from South Vietnam and the possible collapse or defeat of the Saigon regime. In private conversations Kissinger routinely used phrases such as “decent interval,” “healthy interval,” “reasonable interval,” and “suitable interval” as code for a war-exiting scenario by which the period of time would be sufficiently long that when the fall of Saigon came-if it came-it would serve to mask the role that U.S. policy had played in South Vietnam’s collapse. In 1969, the Nixon’s administrations long-term goal was to provide President Nguyen Van Thieus government in Saigon with a decent chance of surviving for a reasonable interval of two to five years following the sought-after mutual exit of US and North Vietnamese forces from South Vietnam. They would have preferred that President Thieu and South Vietnam survive indefinitely, and they would do what they could to maintain South Vietnam as a separate political entity. But they were realistic enough to appreciate that such a goal was unlikely and beyond their power to achieve by a military victory on the ground or from the air in Vietnam. Giving Thieu a decent chance to survive, even for just a decent interval, however, rested primarily on persuading Hanoi to withdraw its troops from the South or, if that failed, prolonging the war in order to give time for Vietnamization to take hold in order to enable Thieu to fight the war on his own for a reasonable period of time after the US exited Indochina. In 1969, Nixon and Kissinger hoped that their Madman threat strategy, coupled with linkage diplomacy, could persuade Hanoi to agree to mutual withdrawal at the negotiating table or lever Moscows cooperation in persuading Hanoi to do so. In this respect, Nixon’s Nuclear Specter is an attempt to contribute to better understanding of Nixon and Kissinger’s Vietnam diplomacy as a whole. Jeffrey is professor emeritus, Miami University, and author of Nixon’s Vietnam War and The Vietnam War Files. B: National Archives and Records Administration, Records of the Department of State, Record Group 59 [RG 59], Formerly Top Secret Foreign Policy Files, 1964-1966, box 5, Def 12 US. Nixon’s Madman Theory—the principle of threatening excessive or extraordinary force—had its origins the brinkmanship of President Dwight D. Eisenhower, under whom Nixon had served as vice president, and Eisenhower’s secretary of state, John Foster Dulles. Claims about how nuclear diplomacy had brought the Korean War to an end against an obstinate Chinese foe became part of Republican Party lore and eventually the conventional wisdom in the United States. Nixon, in particular, would take the lesson to heart. In 1955 Admiral C. Turner Joy contended that the Communist side had made concessions at the negotiating table in response to the Eisenhower government’s nuclear threats against China in May of 1953. In 1956, Life, the mass-market magazine, published a supporting story in which Secretary of State Dulles claimed to have delivered an unmistakable and effective nuclear warning to Beijing on Eisenhower’s behalf in 1953. As the story goes, when Dulles traveled to New Delhi, India in May, he told Prime Minister Jawaharlal Nehru that if the armistice negotiations failed the United States “would probably make stronger . . . military exertions and that this might well extend the conflict,” and if the fighting became more intense, “it is difficult to know what [the] end might be.” To underline this veiled threat, Washington apparently sent secret messages to Beijing through other intermediaries to the effect that failure to reach an armistice would lead Washington to remove constraints on types of weapons and targets. Even if Molotov or Nehru told Chinese leaders about the Eisenhower administration’s signals and interpreted them in the way the administration wanted them to be understood, the warnings were probably not critically important in ending the war. Other considerations were far more relevant to Mao Zedong’s decisions. Nevertheless, Eisenhower’s belief that his threats were relevant had an impact on the thinking of his vice president, Richard M. Nixon, who believed that threats could change the conduct of adversaries. From the first weeks of 1969 through much of the rest of the year, Nixon and Kissinger considered how they could apply “maximum pressure” on North Vietnam and the VC/NLF in South Vietnam, which would have the goal of altering the military situation in their favor, enable them to bargain from a position of strength, and persuade the other side to concede key terms to the U.S. and RVN in negotiations. A combined airborne/amphibious operation against several objectives in NVN. Punitive airborne/airmobile expeditions against enemy lines of communications (LOC) and base areas in Laos and Cambodia. Renewed and expanded air and naval operations against NVN to include closure of Haiphong and the blockade of NVN. Subversion of the population and preparation for active resistance by the people against the Hanoi regime. Each of the proposed military measures was “keyed” to political and diplomatic maneuvers designed to increase the potential for a jarring impact. The proposal for a “technical escalation,” the most startling of them all, amounted to a threat to use atomic and/or biological or chemical weapons and included a “visit” by chemical-biological-radiological weapons experts to the Far East. Haig’s paraphrase of that option, however, focused on a nuclear escalation: “A plan for actual or feigned technical escalation or war against [the] North (nuclear).” The visit by weapons experts would be accompanied by political moves such as a U.S. diplomatic “hint” of a “possible technical escalation of the war” and a statement by a senior military official that the “Pentagon periodically examines moves by which new and more modern weapons” could be introduced into the Vietnam conflict. Laird dutifully passed on the Joint Staff’s proposals to Kissinger, but he disassociated himself from them in his cover memorandum. Not only was this paper “preliminary,” but General Wheeler and other members of the Joint Chiefs had not reviewed it; nor had Laird’s staff. Laird suggested his own skepticism when he wrote that “I must confess to you being more impressed . . . with the potential disadvantages of the proposals than with the possibility of achieving movement in Paris by such means. Disappointed by the lack of substantive movement in the Paris negotiations and Moscow’s unwillingness or inability to persuade Hanoi to compromise on U.S. terms, Nixon and Kissinger initiated another secret military scheme in hopes of levering Moscow’s cooperation or Hanoi’s acquiescence; that is, one beyond the secret bombing of enemy base areas in Cambodia, which had been launched in March. On Kissinger’s suggestion, Nixon ordered the U.S. Navy to carry out mine-laying exercises in the Philippines and the Tonkin Gulf, hoping this ruse would lead Hanoi to believe that the Washington was preparing to mine and blockade Haiphong and other coastal ports along the South China Sea, thus driving them to enter into high-level negotiations. Secretary Laird forwarded the plan that Kissinger had wanted and had been working on with Navy personnel, led by Captain Rembrandt Robinson, one of the JCS Chairman’s liaison officers at the White House. In the spirit of the “indicator actions,” the plan was designed to create a “state of indecision” in the North Vietnamese leadership by “creat[ing] the impression” that Washington was preparing to launch mining operations against North Vietnam. The mining feint plan included detailed step by step “sequential actions” beginning with an inventory of Pacific Command mining assets in Step 1. JCS Chairman Wheeler gave it a tepid endorsement, while Laird wrote that he had “serious reservations.” Nevertheless, Nixon and Kissinger insisted that the plan go forward because they wanted to find ways to induce the North Vietnamese leadership to acquiesce in U.S. diplomacy. The failure of the mining feint to intimidate North Vietnam led Nixon and Kissinger to consider the launching of an actual mining operation against Haiphong. In response to White House requests, senior Navy officers, including White House liaison officer Captain Rembrandt Robinson prepared a mining plan, code-named DUCK HOOK. (A separate plan provided for the blockade of Sihanoukville, Cambodia, to keep supplies from reaching guerillas in the South). Although Kissinger wanted to keep the Defense Department, especially Secretary of Defense Laird, out of the picture, military protocol dictated otherwise, and it was Laird who handed off the plan to Kissinger. The detailed 50-page document was divided into a summary, an intelligence appraisal, mining plan concepts and options, rules of engagement, an optimistic assessment of potential world reactions, and implications for international law (no problem, according to the Navy planners). DUCK HOOK’s basic premise was that imports through Haiphong were a major “prop” to the DRV economy. The closing of the Haiphong port complex, the authors argued, “will have a major effect on the North Vietnam economy and the ability of the North Vietnamese to support the war in the south.” The mining operation against Hanoi included three options. Option Alfa involved three aircraft carriers, Bravo two, and Charlie one. With each option, the purpose was to block large merchant ships from access to Haiphong Harbor as well as to “disrupt” any attempts by Hanoi to use smaller, lighterage craft to offload merchant ships anchored past the minefields. During the following months, the character of the DUCK HOOK planning would change as Kissinger and his aides decided that mining by itself would not be enough. By early October 1969 DUCK HOOK would include options for bombing of urban and industrial targets in North Vietnam. Source: Richard M. Nixon Presidential Library [RPNL], Henry A. Kissinger Office File, box 106, folder: Mister “S,” Vol. 1 (1 of 2). DDUCK HOOK was accompanied by dire threats communicated by Nixon and Kissinger directly and indirectly, warning Hanoi that unless they responded positively to US negotiating demands by November 1, “measures of great consequence and force” would be taken against North Vietnam. He has decided to hope for a positive outcome from the conversations at Paris by 1 November, and he is prepared to show good will by some humanitarian gestures, which Mr. Kissinger will be prepared to discuss in detail. But if, however, by this date—the anniversary of the [Johnson] bombing halt—no valid solution has been reached, he will regretfully find himself obliged to have recourse to measures of great consequence and force. . . . He will resort to any means necessary. Unconvinced, Pincus and Paul “repeatedly demonstrated” their concern to a U.S. Embassy officer about the possibility of “military actions that could increase our … level of involvement in Vietnam.” As if to lend credence to their concerns, Pincus and Paul noted that during the presidential campaign Nixon had discussed the mining of North Vietnamese ports, especially Haiphong Harbor, as a means of wringing concessions from Hanoi. Soon, Pincus and Paul reported their findings and concern to Committee chairman Senator J. William Fulbright (D-Ark), who soon raised the danger of escalating the war in communications with Secretary Laird. Besides the mining readiness issue, Pincus and Paul were investigating U.S. nuclear weapons deployments in the Philippines; hence the excisions and the “Formerly Restricted Data” classification of this message. A “concept of operations” paper prepared in mid-September is a clear example of putting “all options on the table.” Besides possible ground action against North Vietnam, including an amphibious operation, the planners considered nuclear-use options, perhaps the only time that Nixon White House planners put nuclear options on paper. Decision point four consisted of two elements. One incorporated “major air strikes against high value target systems,” such as electric power and air defenses. The other was a “clean nuclear interdiction of three NVN-Laos passes.” What was meant by “clean” was very likely was a nuclear weapon that did not have dirty, fallout-producing effects. The aide or aides who drafted the concept of operations—Robinson perhaps—may simply have had in mind an airburst of a low-yield tactical nuclear weapon. In any event, the concept of a so-called clean nuclear weapon was partly designed to reduce the political opprobrium of using nuclear weapons, but that was probably wishful thinking. Decision point five included another nuclear option, the “nuclear interdiction” of two railroad lines that connected North Vietnam with China; it did not specify “clean” weapons. What would be our concurrent movements of ships to the area, our state of strategic readiness, our posture in Korea and Berlin? If we go as far as the interdiction measures in (4) and (5) [the nuclear measures], what other actions would we take at this very high level of escalation once the precedent is established? What would we do if these actions fail? What counter-actions should we take in various contingencies? By “state of strategic readiness” Lake meant the alert posture of U.S. nuclear forces and the extent to which they were poised to signal determination and be ready for rapid use in a crisis. By “precedent,” Lake may have been referring to the first military use of nuclear weapons since 1945 with all of its implications for the “nuclear taboo” that had contributed to restrained U.S. nuclear use practices for decades. On White House orders—and as members of Kissinger’s staff began working on a concept for what some unofficially called DUCK HOOK—General Wheeler ordered the formation of a military “planning group” composed of members drawn from MACV, the Seventh Air Force, and the Seventh Fleet to rendezvous at the MACV compound in Saigon for the purpose of designing an operational plan for attacks against North Vietnam Their plan was supposed to be based on the White House DUCK HOOK concept of a sharp and sudden blow over a limited period of time for the purpose of mainly achieving diplomatic and political ends. But group members favored what they thought of as a “sound military concept”—that is, one designed to achieve primarily military ends. This decision put the JCS group at odds with the White House concept of an offensive that would have both military and political/diplomatic purposes. The JCS plan-in-the-making was codenamed PRUNING KNIFE. Antiwar demonstrations scheduled for mid-October and mid-November 1969 cast a pall over Nixon’s planning and helped shape his decision to cancel the prospective military operation against North Vietnam. The forthcoming15 October Moratorium and the 13-15 November Moratorium and New Mobilization made Nixon worry about the signal that would be sent to Hanoi by the coincidental timing of the bombing-and-mining operation scheduled to begin soon after 1 November. In a 29 September telephone conversation with Kissinger, Nixon explained that “he doesn’t want to appear to be making the tough move after the 15th just because of the rioting at home”—that is, the Moratorium. Although Nixon believed that Secretary of Defense Laird might have been right in predicting that about three months after the operation began “it will have relatively high public support,” Nixon said he “would like to nip it before the first demonstration, because there will be another one on 15 November.” He believed there was a possibility that the days following the launching of the military operation in early November and leading up to the second Moratorium and New Mobe in mid November, “horrible results” might be produced by the buildup of “a massive adverse reaction” among demonstrators. Laird pointed to other problems, including the possible loss of over 100 bomber aircraft within five days; “high” civilian casualties in North Vietnam; the risk of stepped-up DRV attacks in the South; and North Vietnam’s development of “sanctuary air bases” in China for its aircraft. Moreover, Laird argued, once the campaign began, the U.S. military command might want to escalate further by requesting additional “operating authorities,” such as a quarantine or blockade of Cambodia; “ground incursions into Cambodia, Laos, and NVN”; and “B-52 raids into NVN,” which presumably would be mass-scale attacks. Sensitive to the domestic U.S. implications, Laird anticipated a “devastating” public reaction if U.S. casualties grew. In any event, “demonstrations would have to be expected” around the world and at home. This would be all the more the case if Washington could point to no “provocative” North Vietnamese action to justify an attack. an integrated plan of military actions to demonstrate convincingly to the Soviet Union that the United States is getting ready for any eventuality on or about 1 November 1969. . . . . Rather than threatening a confrontation (which may or may not occur), the objective of these actions would be a demonstration of improving or confirming readiness to react should a confrontation occur. On the basis of earlier discussion at the Pentagon and Laird’s approval, JCS Chairman Wheeler sent out messages to the various CINCS instructing them to take approved readiness measures, including stand-downs of air operations to facilitate a higher state of alert, so they would be in a position to “respond to a possible confrontation with the USSR.” To avoid complications, there was to be no change in the DEFCON status. The directed actions should be “discernible to the Soviets but should not be threatening.” The next day Laird sent to President Nixon copies of the telegrams along with an “Outline Plan for Testing Military Readiness” and a public affairs plan. Well before Nixon ordered the readiness test, the Defense Department had scheduled an annual strategic command post exercise, HIGH HEELS, which gave decision-makers and senior officials a chance to familiarize themselves with nuclear war plans and nuclear use procedures in a war game context. HIGH HEELs was a world-wide exercise that involved all of the military commanders-in-chiefs, at home and overseas, and planning for it was already advanced. It was this consideration which made Secretary of Defense Laird want to postpone the readiness test, but Kissinger would not hear of that. At the same time, intelligence officials were concerned that the simultaneous operation of the readiness test and HIGH HEELS could be potentially dangerous because exercise operational messages that called for nuclear weapons use in a particular contingency might be detected by the Soviet adversary and linked to actual on-going readiness and alert operations around the world. As a Defense Intelligence Agency official put it, “an incident involving a message containing threatening material, along with Soviet observations of actual U.S. movements, radio silence, and stand-down activities, could cause a hazardous situation.” Moreover, the increased volume of HIGH HEEL message traffic could cause delays in the receipt of “critical non-exercise” messages about Soviet reactions to U.S. military moves. In light of these problems, Kissinger’s objections, and Joint Chiefs of Staff recommendations, Laird agree to strip back HIGH HEELS so that it involved only officials in the Washington, D.C. area, leaving out the CINCS altogether. To get Moscow’s attention but without unduly worrying it, the Nixon White House wanted the Pentagon to take as many actions as possible. Consistent with this, JCS Chairman Wheeler asked the CINCs for proposals and after receiving suggestions, the Joint Staff reviewed them and prepared a master list for top officials. In his memorandum to Laird, Wheeler noted that the proposed actions “would reflect an increase in intensity of signals received by the Soviets.” With the involvement of the naval, air, and other forces of eight unified and specified commands, the proposed actions would occur on a world-wide basis, from the Atlantic to the Pacific Oceans, ranging from movements of aircraft carriers in the Atlantic and of destroyers in the Gulf of Aden to SAC airborne alert and the surveillance of Soviet merchant ships heading toward Haiphong Harbor. This same document appears in the State Department’s historical series, Foreign Relations of the United States in the volume on national security policy, 1969-1972 (document 82). But there are interesting differences in the sections on Pacific Command and Strategic Air Command. For example: that PACOM would “enhance SIOP Naval Forces at Sea” is exempted from FRUS, and keeping MACE missiles on alert is excised from the release to the National Security Archive. A crucial point–that SAC B-52 airborne alert bombers would carry nuclear weapons–was withheld from the FRUS, but released to the Archive. Consistent with the White House’s objective of sending signals Moscow over the state of the Vietnam negotiations, a proposal to surveil Soviet ships heading toward Haiphong Harbor had been on Robert Pursley’s list of possible operations for the readiness test (see document 12). For economy reasons, JCS Chairman Wheeler dropped the proposal until Kissinger and Haig pressed to reinstate it, and it was duly included in the package of additional measures that Laird sent Kissinger on 16 October. Not all of the relevant messages are available, but Seventh Fleet archival records include the Commander’s directive and a report on the successful interception and shadowing of the Svirsk by the U.S.S. Orleck on 20 October 1969. The reference to “Snoopy Video Tape” in document B is to a small helicopter-type drone used for photographic intelligence collection, in this instance, photography of the Soviet crew as it took notice of the shadowing activity. This chapter excerpt provides a detailed overview of the phases of SAC nuclear operations during the readiness test: (1) the initial stand-down and higher ground alert beginning 12 October, (2) the resumption of flying activities on 18 October, (3) the return to stand-down during 25-30 October, and (4) the “Giant Lance” nuclear-armed airborne alert operation during 27-30 October. After reviewing Wheeler’s instructions to take “discernible” actions to raise the readiness of U.S. forces, the SAC historian noted that the Command received no information about the “origin or purpose” of the readiness test. Nevertheless, SAC officers speculated at the time that it was related to the Vietnam negotiations and to Nixon’s forthcoming speech on 3 November speech, which had been announced on 13 October, early in the readiness test. Early in the secret alert, Kissinger tasked the intelligence community to keep its antennae up to detect any Soviet reactions to the heightened readiness posture. As the activities began to draw to a close, the CIA prepared for Kissinger (which he initialed) a short report which listed “noteworthy Communist” military measures and the degree to which they may have been responsive to the readiness test. Because so much information in the report was derived from communications intelligence (COMINT, classified as “Top Secret Umbra”), only one activity–the reverse course by Soviet ships in the Red Sea on 21 October–has been declassified. The Soviet activities that Washington espied were then secret and how much the intelligence community knew about them remains a secret. This document has been published in the State Department’s historical series, Foreign Relations of the United States (Document 89), but the version published here has more information: a reference to the Chinese alert and details on Soviet naval activities of 21 October. As part of the intelligence watch, the Defense Intelligence Agency prepared regular reports on what it saw as Soviet reactions to the readiness test activities. The document dated 28 October (also initialed “HK”) is representative of the series. Like the CIA memorandum, the report has been massively excised because so much of it is based on COMINT. It is worth noting that this document and others in the “Special Intelligence” series is located in the Vietnam files at the Nixon Library, further evidence of the readiness test’s connection to the White House’s Vietnam strategy. So far no evidence has shown up from the Soviet side (for example, in the memoir literature: (Gromyko, Dobrynin, etc.) of awareness of the alert. Whether the Soviets even saw a connection with Vietnam or not is so far unknown and cCertainly, the alert had no impact on Moscow’s Vietnam policy or on Hanoi’s position in the Paris negotiations. During the course of 1972, a secret Department of Defense panel led by Assistant Secretary of Defense for Research and Engineering John S. Foster prepared a special policy review of “employment policy” for the use of nuclear weapons. The purpose was to give U.S. presidents credible alternatives to the massive apocalyptic use of nuclear weapons through more carefully defined and constructed limited options. One of the participants in Foster Panel policy review, Gardner Tucker, had a discussion with Kissinger which touched upon the Madman Theory. Few such explicit discussions have come to light so far. Distancing himself a little from Nixon, Kissinger said: the “President’s strategy has been (in the mid-East crisis, in Vietnam, etc.) to ‘push so many chips into the pot’ that the other side will think we might be ‘crazy’ and might really go much further.” Nevertheless, in Nixon’s absence, Kissinger followed the Madman strategy during the October War (1973). Source: RG 59, Records of Henry Kissinger, 1973-1977, box 9: July 1974 NODIS Memcons. The decent interval concept remained central to Kissinger’s thinking about the U.S. exit from the Vietnam War after 1969. For example, on 3 August 1972, Kissinger reminded Nixon of the outcome they were aiming for: “We’ve got to find some [negotiated] formula that holds the thing together a year or two, after which—after a year, Mr. President, Vietnam will be a backwater. If we settle it, say, this October, by January ’74 no one will give a damn” (Oval Office Conversation 760-6, Nixon and Kissinger, 3 August 1972, Nixon White House Tapes, Nixon Library). On 23 October 1972, at the time Kissinger had struck a deal with Le Duc Tho and was trying to win Thieu’s approval for the agreement, Nixon told his hawkish aide Alexander Haig, who was skeptical of Kissinger’s negotiations: “Call it cosmetics or whatever you want. This has got to be done in a way that will give South Vietnam a chance to survive. It doesn’t have to survive forever. It’s got to survive for a reasonable time. Then everybody can say “goddamn we did our part.”. . . I don’t know that South Vietnam can survive forever” (EOB Conversation no. 371-19, Nixon and Haig, 23 October 1972, White House Tapes, Nixon Library). In July1974—a year and a half after the Paris agreement and five months before VC and NVA fighting would begin to build up to the 1975 Spring Offensive that would overrun South Vietnam by April 1975—Ambassador to Saigon Graham Martin told Kissinger and his aides, Lawrence Eagleburger and W. R. Smyser: “Militarily, they [the South Vietnamese] are holding. Politically, they are more solid than I had the right to hope.” Kissinger replied: “When I made the [January1973] agreement, I thought it might be a two-year thing.